Aaah, the January Blues! Never reds, greens or purples. The most unpopular month if you’re in the northern part of the northern hemisphere. 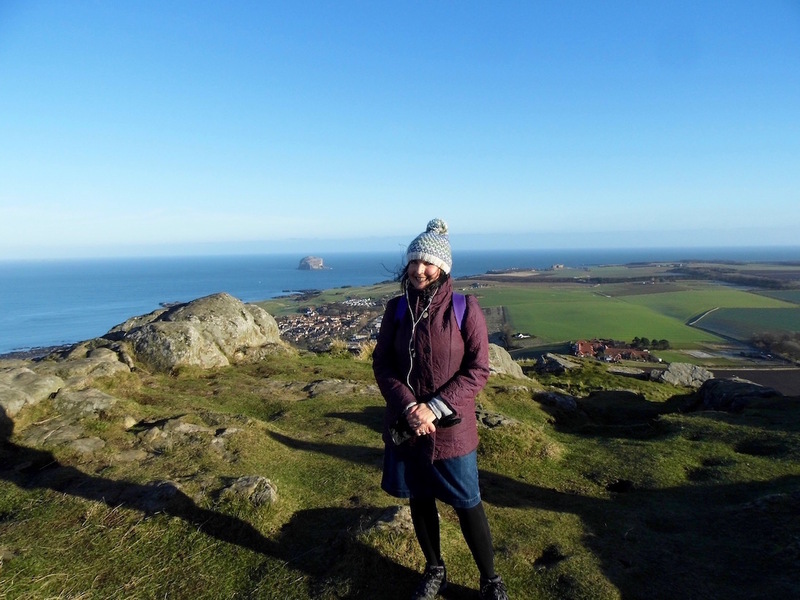 Which made it a perfect time to visit the seaside town of North Berwick near Edinburgh. I’d love to know what antipodeans feel about this month at the height of their summer and if they have a general low-point on the calendar. And I decided that if I can’t be in warmer climes then I was still going to enjoy a visit to my favourite place and first home town. Plus the tranquility this out-of-season time offers. 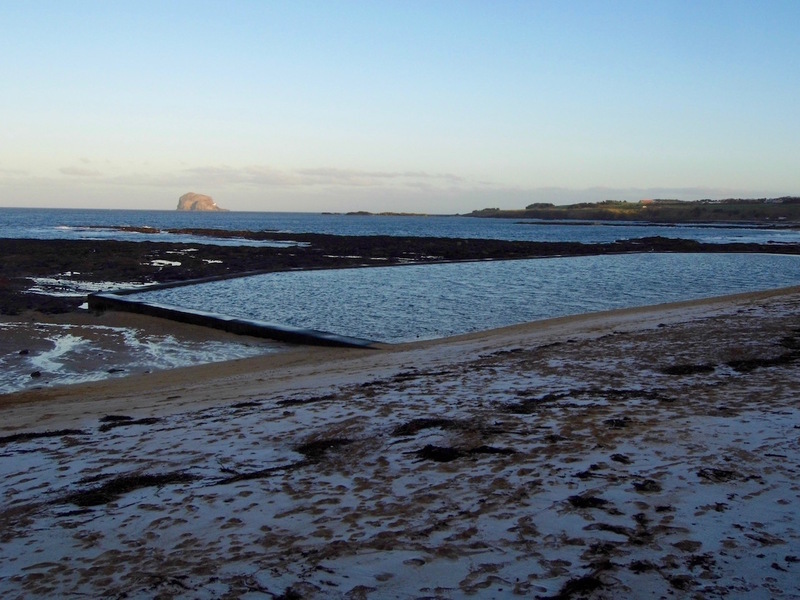 I’m determined not to succumb to Blue Monday or the January Blues full-stop, so last week I came here to North Berwick for an artist talk. Monday turned out to be one of those crisp and sunny winter days which in truth I enjoy as much as any summer ones. Here are six of my January Blues bashers from last Monday. See this big hill? It’s called Berwick Law and it’s 186m/613ft. 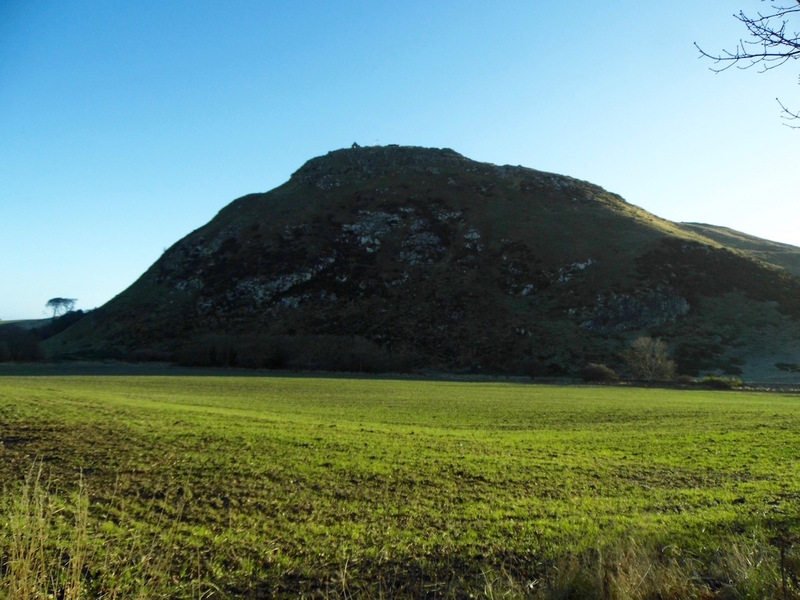 It’s one of a number of volcanic plugs in this part of Scotland and rises like a giant plook* above the town. As I sat on the train going into town, I saw it on the horizon and thought… hmmm. I’ve got two hours to spare once I arrive. I’m going to climb the Law. 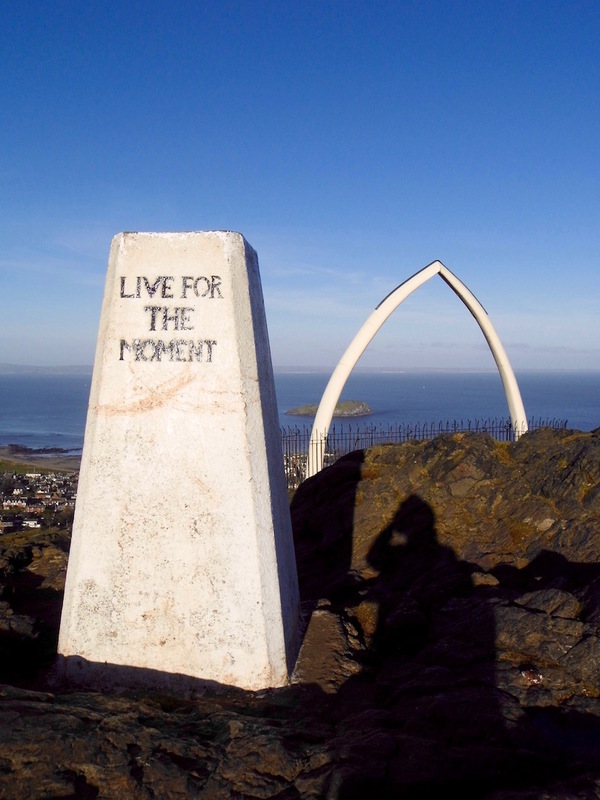 You’d certainly keep fit if you climbed the Law every day. I think my dad did it in twenty minutes (he was twenty at the time). His father-in-law, my granddad, tricked him into running to the top then waving back to us. And my city boy father had no idea when he accepted the challenge that no one would see him and that Granddad was pulling his leg. Well it took me a bit longer than twenty minutes, but not much. Although parts of it were a slog I kept going, passing other climbers on the way up and at the top. From the top the view is stupendous, all the more so today as it was so clear. 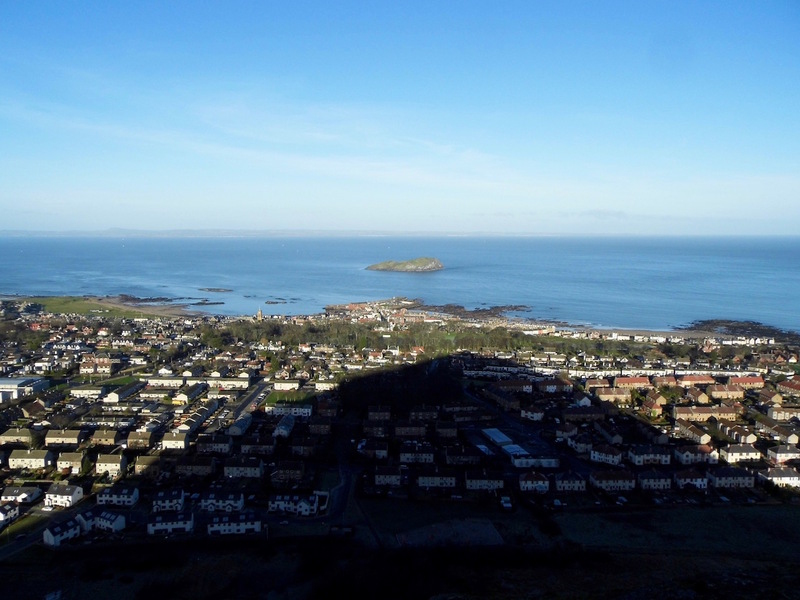 To the north is Fife and westwards is Edinburgh and Arthur’s Seat, another volcanic plug. One of my childhood memories is going to the back of our house one evening where some of the neighbours had gathered and seeing a glow rising above the Glen, the small wood that lay between our street and the playing fields. The Law was on fire. However, like many childhood events that become part of your personal story, I’m not sure what the real story was. Or if it even happened at all. Ha! Where oh where is my blog husband, as in that ever-so handy person you can rely on to take cracking photos of you? And who patiently agrees to keep snapping until you get one you like. Although it is a cracking photo, taken by another Law climber, since it proves I made it to the top. And what a climb! This year my other half is determined to introduce me to the joys of climbing the munros, so although the Law is far smaller it’s still good practice. Apparently Glasgow, my city, has some of the worse air quality in the UK, maybe because it sits in a valley. Plus having lived in London for many years, I can attest to how unpleasant a cycle ride into work could be amongst the never-ending traffic. No wonder I look so happy! I do love how the lines of the horizon and the beach are meeting as an arrow on the right of this photo. And I chose this photo for this sub-heading because aged four I walked around the perimeter of this paddling pool with Granny Pip in tow. It was a choppy grey day though the tide was out, and I decided to bomb into the pond to see if Granny would follow to pull me out. She did. Ten minutes later my mum opened the from door to see her own mother and her small daughter, completely drenched. Memories, happy ones, are never far when I’m back here. Sometimes I’m surprised that I spent such a little about of time here. And yet I have more affection for this little town than I do for places I’ve spent far longer. Wow, I pat myself on the back that I took this photo! Days are shorter right now. But when I strolled along the beach here last week I could tell it was already some minutes longer than at midwinter. Those extra few minutes make all the difference when the January Blues strike and reassures you that spring will be back (obviously!). North Berwick, along with St. Ives in Cornwall, has the most beautiful quality of natural light in the whole of the UK (for me at least). On this day, while it was too dark to read, the sky was a bright cobalt until about 4.30pm. Over the Firth of Forth lies Fife and it’s a pretty sight when all the street lamps are lit and people in the towns across the sea turn on their house lights. The blinking of the lighthouses on the Bass Rock, Isle of May and Fidra plus the harbour lights add to this twinkly atmosphere. As do passing ships, moving out towards the North Sea and beyond. It’s small wonder that both towns draw so many artists and inspire so much art itself. Crikey, I think this is the only photo I took that doesn’t have any of the colour blue in it! This is one of my favourite North Berwick cafes, Why Not?, housed in an indoor market of the same name. 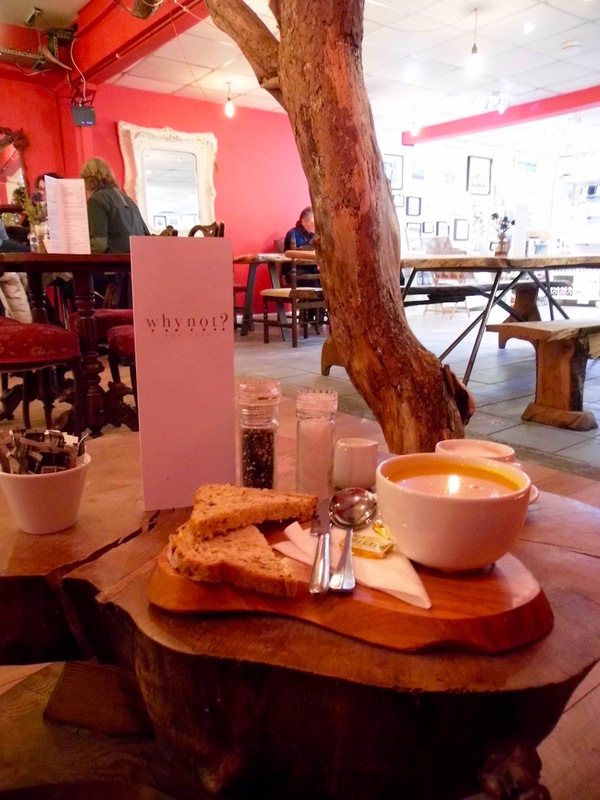 Nothing beats a hot bowl of vegetarian soup and great coffee after a bracing beach walk, especially in such a cosy cafe. In my childhood it was a small supermarket (if I remember correctly) and they’ve since made it into a fab place for art, local craft and produce. As I strolled around the market I spotted work by various East Lothian artists. All of them produce beautiful work featuring seascapes galore. It’s hard to pick a favourite amongst them as they all have their own styles, but perhaps I’d say Bonzo-Art since Rachel’s work is so fun and colourful. Definitely worth a wee visit if you’re in town. I’m very lucky that, even though I don’t live in the town itself anymore, I’m close enough for a day visit. I popped down for an artist talk at the North Berwick Art Group. The speaker was Jim Cramb and he did a very interesting presentation on the Scottish Colourists. 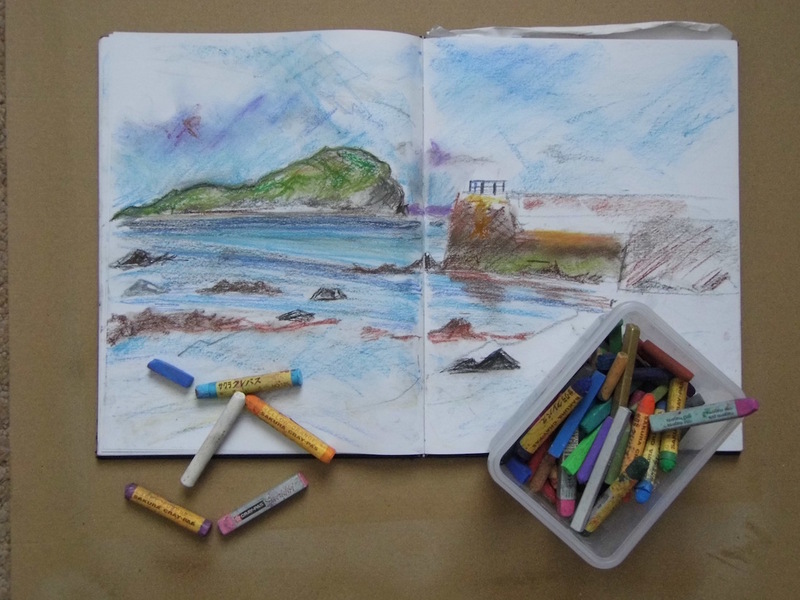 I love using colour in my work so wanted to come through, plus do some sketches to help me create my own splashes of Scottish colour. I’m particularly keen to check out some of Fegusson’s work. Plus it was interesting to hear about the general interest in Japanese art that was rising during the Impressionist to Post-Impressionist periods. Before the talk I did a quick sketch of the view outside the Hope Rooms where the even took place. Hmmm, maybe sitting on a freezing beach isn’t a great plan, even if you aren’t poorly. But I just love the sea views here and always draw the islands when I visit. Go on, make a wish! 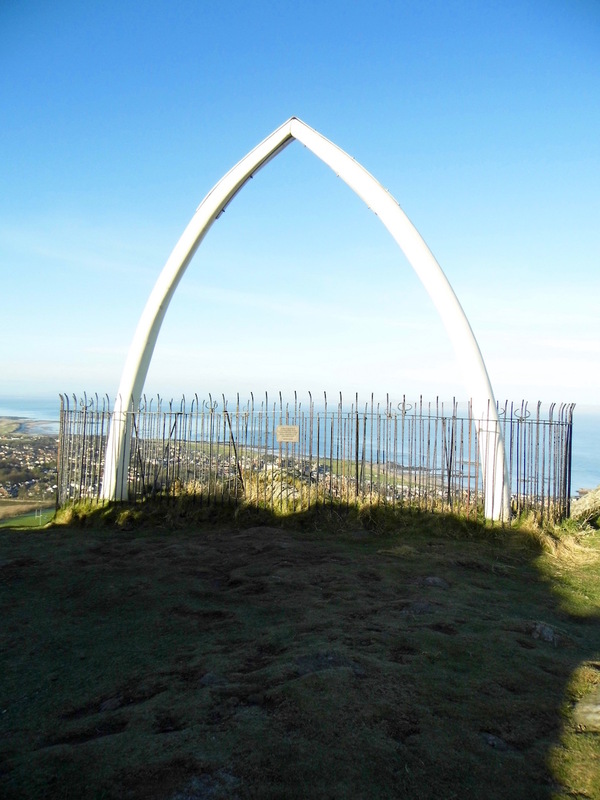 This big wishbone is the whale’s jawbone and until the mid-2000s it was a real whalebone. After it withered it was replaced three years later. But while it was gone we all missed it. It really is part of the furniture, so a new one was gifted to the town – but this one made in fibreglass. Meanwhile, how are those plans for the year going, by the way? Because today’s the day they all disintegrate and we realise how useless we are at making plans. If you believe everything you read, that is. I’m certainly sticking to mine so far as this has been my second sketchbook day out of the year. Phew! That was a long post. How about you – do you get the January Blues? Or do you quite welcome this time of year? Let me know in the comments. "Luss: Adventures with my sketchbook"
"6 Blue Paintings for the January Blues"
Berwick is amazing, I haven’t been for YEARS! Need to get it on my travel plans! Indeed it is a tree, Claire. It’s a great bit of decor – they’ve got it looking really cozy in there. It’s a lovely place to sit and read if you go by yourself too. Yes, you should plan a visit when you’re that way next.